Every team in the NFL comes from a great American city with great culinary traditions! This football season, I embarked on a culinary quest to develop a unique burger inspired by each of those 32 NFL teams. For every team I've tried to draw from the regional specialties and the vibe of the city, and I hope I did every team, and every town justice. Most importantly, I hope you find at least a few burgers you find worthy of trying! We’re going to start of journey of NFL Team inspired burgers with the Tennessee Titans. The burger is made of ground beef, which I dust in one of my favorite dry rubs, salt and pepper right before frying off in the pan. Before it’s finished, I top the patty with some jalepeno jack cheese, and homemade pulled pork (you can use store bought pulled pork, or pre-cooked rids and shred the meat. Once cooked, and rested, I top the whole thing with fresh coleslaw and a bit of BBQ sauce. Damn that’s a tasty burger. For the Buffalo Bills the choice was pretty obvious, yes, you guessed it…a Buffalo Chicken Wing style burger. To keep with that flavor profile, I used some ground chicken (turkey would work well too) instead of beef. I sear off the burger with some simple seasoning, and then drench it in wing sauce (mine is very simple: butter, hot sauce, worchestershire sauce). 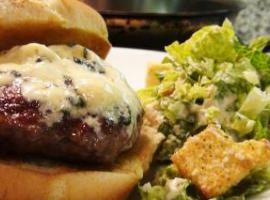 I like to serve on a toasted bun, top the burger with extra chunky blue cheese dressing, and fresh celery leaves to complete the combination and hit all those flavors of one of my favorite bar foods. Hopefully it’s a burger the Bills, and their fans, are proud of! I gotta say an idea for a Minnesota Vikings burger didn’t jump out at me immediately, and so I ended up doing a bit of research. It didn’t take long to find the Juicy Lucy – apparently a Minnesota tradition that’s morphed into dozens (perhaps hundreds) of variations. At is core, it’s a stuffed burger, and as far as I can tell, the original(s) use American Cheese as the stuffing. So let’s go original. Here I show you how to wrap two thin pattys around two slices of American cheese to create a monster burger. I decided to grill mine off, and then top it with even more American cheese. The result was phenomenal. Let it rest for a few minutes, and watch out for the molten cheese on that first bite. And thanks to the Vikings and Minnesota for giving me a new burger recipe. It was pretty easy to come up with the Eagles inspired burger – who doesn’t love a cheese steak! I made mine with a thinly made beef patty that I quickly sear on the stove top. Then, to get that cheese steak feel, top it with some sautéed onions and peppers, smother it in cheese whiz (gotta use the real stuff), and served on a hoggie roll. Pro Tip – Wrap it up in foil or wax paper for a few minutes to allow the roll to soften a bit and adsorb some of those juices. Go Eagles! My burger for the Arizona Cardinals was another pretty easy choice. I love the flavors of the Southwest and bring them to bear in this burger. I start by fire roasting a pasilla pepper (although you can use others), and then cleaning off the skin and seeds, leaving that slightly spicy, sweet flesh – which is my first burger topping. Along with the pepper I like to use fresh guacamole and pico de gallo. To make sure they aren’t over powered, rather than a beef burger, I’m using a chicken patty, which provides a great platform for all these flavors to blend together. Ample opportunities to spice up this burger, and hopefully for AZ fans, the Cardinals bring the heat this year! There were a number of options for my Cincinnati burger, but frankly most of my research kept coming back to Cincinnati style chili – and so we’re going for it! For the Bengal’s burger I’m using a beef patty, that I decided to grill to get some smoky/char flavor. Once cooked, and rested….and bunned (is bunned a word?) I top the whole magilla with about a cup of chili. Now, to be true to form, Cincinnati chili is more like a chili con carne than a Texas chili, and also uses spices like cinnamon and all spice which give it a distinctive flavor. Make sure the chili is piping hot and then top it with some shredded cheese which will start to melt right in. Yes, it’s a bit messy, but it’s more than worth it! Go Bengals! Great Deli goes hand and hand with New York City, and for the Jets, I decided to reflect that with my Reuben Burger. I use a beef patty (make sure to shape it like the bread) which I make pretty thin and sear off in a pan. To reuben-ize it, I serve the burger on some toasted rye bread, and top it with pastrami, melted Swiss, and sour kraut. Completing the burger is of course, a thick spread of thousand island dressing. I loved making it, and I hope it does the Jets proud. Given there are 3 California NFL teams, I knew I’d end up making a “California Burger” at some point. The San Diego Chargers get the honor of the state’s namesake burger, if for no other reason, than it’s probably the healthiest burger on the menu, and given San Diego has beach weather 12 months a year, they stay pretty damn fit! My California burger is a well seasoned chicken patty, seared off on the stove top, and then served up with fresh lettuce, heirloom tomatoes, avocado…and cheating just a bit on the health side, a couple strips of bacon. Simple and straight forward, its fresh, light and delicious! Go Chargers! As I’m not going to actually cook a dolphin, the Cuban sandwich seemed like a great idea for my Miami inspired NFL burger. Instead of a beef patty, I decided to grill off a ground pork burger, seasoned with some BBQ rub. Once cooked, I slide that burger between some good quality French bread, top it with some pickles, ham, and Swiss cheese, and cook it a bit longer in my homemade panini press. Admittedly, it’s not quite as good a sandwich as a traditional Cuban, but it’s damn good burger, and I hope it does the Dolphins proud. When I think of New York, I think about the New York Pizza slices, and so that’s where I took my Giants burgers. To get as many pizza toppings in as I good, I mixed some Italian sausage with the ground beef to form the patty. Then for toppings, I added some onions, peppers, pepperoni, pizza sauce, and of course mozzarella cheese. This was one of my favorite burgers to make, and is one of my kids favorites! Once I saw that Fritos got their start in Houston, the direction for my Texans inspired burger was pretty well set. The burger itself is a straight forward beef patty, seared off on the stove (although the grill would be great too). But to top it, I make some queso with good old Velveeta cheese, and spices. Then along with the queso, mix in some Frito corn chips. How could the best that combo, topped on a burger, not be great. Enjoy Texans fans! There’s a number of reasons, I associate New England with Thanksgiving, and I tried to incorporate as many of those flavors in my Patriots burger. The patty is ground turkey with several traditional turkey stuffing ingredients. Along with that burger, I’ll make some maple syrup glazed bacon, add a bit of VT cheddar, and a beautiful chunky cranberry sauce. It’s Turkey day all year long! The Panthers are inspiration for another BBQ burger, but this one focused on the pig. Instead of using traditional bacon, I bought some pork belly, which I sliced thick and slowly braised until tender. Then I seared it off on the grill along with a beef patty, and topped the whole magilla with fresh cole slaw and BBQ sauce (please forgive me for it not being mustard based). That pork belly is amazing and this is one of my favorite burgers! Leave it to New Orleans to come up with the coolest name for the sub sandwich! My Saints inspired burger is just that – a sub sandwich - or a Po Boy. I seared off a beef patty that I cover with Cajun spice for an extra kick. Once cooked, slip it into a good quality fresh French roll, and top it with lettuce, pickles, onions, and tomatoes…of course, you can add just about anything you’d like. My final add, is a bit of Cajun mayo, which is super simple to make, and goes great with the burger. Enjoy New Orleans! I grew up in Maryland, and remember tearing into the bushels of blue crabs covered in Old Bay tossed out on the picnic table. So it was easy to choose the Crab Cake burger for the Ravens. As a West coaster, I had to use Dungeness crab, but I kept the Old Bay, and show you a simple homemade tartar sauce. Don’t forget to sear off the bun for a bit of extra texture, that really makes the burger! I love Texas BBQ Brisket, and knew that one of the Texas NFL teams was going to get the Brisket Burger. The Cowboys drew the lucky card. This burger has a beef patty that I seared on the stove (but grilled would be even better), that I top with slow cooked caramelized onions, and melted spicy pepper jack cheese. On top of that, are thick slices of BBQ brisket, smothered in BBQ sauce. Yippie Ki Yay! I don’t know a ton about Green Bay, but with just a bit of research, I found beer, brats, and cheddar cheese to be a common theme. For my Packers burger, I use all three. I simmer some brats in beer and onions, then sliced them thin to use as I normally would use bacon. Then with the beer braising liquid, I made a cheddar cheese sauce to pour all over my beef patty and brats. To finish, why not a few of those onions too. Damn, that’s a good burger, and thanks Green Bay for the inspiration. After toying with a few "mile high" ideas for my Denver Bronco's burger, I settled, on the mile high, Denver Omelet burger. I sauté off some red and green peppers (you can use hot or mild) along with some onions, that I use as a topping for a beef patty. Of course, I'm also using few strips of bacon, but the true topper, is a sunny side up egg, covered in melted cheddar. Throw it all on the seared burger, and you've got a burger I hope any Broncos fan would recognize. I’d never heard of the fried pork tenderloin burger until I started doing research for my Colts inspired burger. I’m very happy I found it and frankly didn’t change much. After marinating the pounded out tenderloin, I seasoned, breaded, and fried it up. It was damn tasty served on a hamburger bun with some mayo, pickles, onion, tomato, and lettuce. I'm sure just about every Pittsburgh native knows Primanti brothers, which is where I got the idea for my Steelers burger. 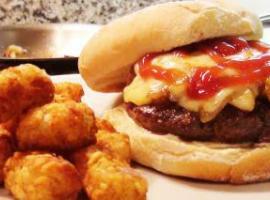 This burger is a beef patty that I sear on the stove top, and cover with some provolone cheese (melted to perfection). The cheeseburger is then served on slices of fresh French bread, and topped with french fries, cole slaw, and your choice of fixings...tomato and onion for me! Good eating Steel Town. It was actually pretty easy to come up with DA BEARS burger. The Chicago Dog, garnished with just about everything but the kitchen sink, is already world famous...and it's pretty easy to make a hot dog shaped burger. I've got all the traditional garnish on this one, my one addition (cause cheese belongs on a burger), is stuffing this dog with some shredded cheddar cheese. Enjoy it Bears fans! While I knew early on that my Detroit Lions burger would be a "Blues" burger, but I wanted to make sure I took it further than a normal blue cheese burger. Once I found out about Better Made potato chips, I found my answer! A Detroit staple, and frankly a great burger topping, I combined them with a creamy, tangy blue cheese sauce for this Lions inspired burger, and I hope my Detroit fans love it! I'm a San Francisco native and one of the first "foods" I fell in love with here, is the wines from Northern California. I use a beautiful zinfandel wine, to braise down some caramelized onions until they are sweet and luscious. Along with those braised onions is some salty blue cheese (I love Point Reyes), and of course, a sour dough bun. St Louis has some great food choices, and it was hard to narrow it down, but once I found the Slinger Sandwich, the Rams inspired burger was as good a made. This version has seared beef patty, that gets topped with hashbrowns, cheddar cheese, chili, and finally a fried egg. It's burger & breakfast monster, and it's delish! My Cleveland Browns inspired burger draws on the influence of Eastern European cuisine, as well as good old American French Fries! For my Polish boy burger, I seared off a beef patty, topped that with a good helping of Kielbasa, some fries, and then coleslaw. To add one more twist, you may want to smother yours in BBQ sauce! Tampa Bay Buccaneers Blacked Fish "Burger"
Interestingly enough Tampa is home to a number of big national chain restaurants, but I wasn't able to draw inspiration from any of them. Instead, for the Buccaneers' burger, we're looking to the bounty of Gulf Coast, and making a blacked fish burger. Locally, this is made with grouper, but that can be hard to find (it was for me), so I'm using snapper, covered with some cajun spices. Grilled to perfection, this makes an awesome sandwich! I knew that I wanted to get peaches into my Atlanta Falcons inspired burger, and I found two ways to do it. I made a fast & easy jalepeno peach BBQ sauce which brings out the sweet & the heat in both. Then, I top the burger with raw peaches, which still have their bright acidic flavor. For salty components, I've make some prosciutto "chips" (really easy), and use Feta cheese. The combo is fantastic. Kansas City BBQ is some of my favorite. And, in my opinion, the most liberal with style choices...pork, beef, chicken, seafood, everything is on the table. So, i decided to "push the edge" myself, by stuffing a beef burger, with pulled pork. The pork makes the burger so juicy and flavorful, it's hard to believe. And it makes a nice little surprise for your guests! Seattle is a town with some great food options & it was hard to figure out which to choose. Coffee & Cherries are two that jumped out at me as great burger choices. I make a quick coffee rub for the burger, which adds a slightly bitter, smoky, and spicy flavor to the burger, balanced out by the cherries, which I saute down with some caramelized onions. Soooo Good! While the Mid-Atlantic has it's own great regional food, I couldn't help but make Washington's burger with a political spin. The Red vs Blue burger, uses roasted red bell pepper to provide a sweet and savory flavor to the burger. That is offset by the salty and tangy blue cheese melted on top. It's a really simple combo that packs a ton of flavor. I love food trucks, and seek them out whenever I can, and Oakland was one of the early pioneers of Food Truck culture. In an ode to those days, I make the Oakland Raiders taco truck burger. A chorizo and beef patty, seared off and wrapped in a tortilla with avocado, cheese and pico de gallo. Make sure to cook the tortilla a bit after wrapping for a bit of extra flavor & texture! I credit my wife, who spent time in Jacksonville for the Jaguars Biscuits and Gravy burger. Jacksonville is home to some great Southern cooking, which is exactly what I tried to show in this beef and sausage burger, served on a fresh baked biscuit, with sausage gravy. Delish, but you'll probably need a knife and fork for this one!